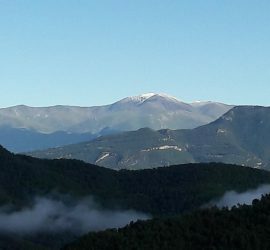 In the middle of the Ripollès region between rivers, valleys and mountains, you can find the Castell de Llaes. A unique place of exceptional beauty where the absolute tranquility reigns in the middle of a lush nature. 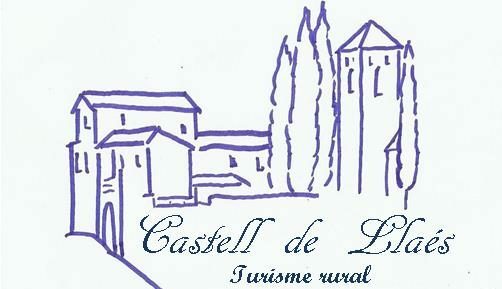 Castell de Llaés is a 10th century castle, a Cultural Good of National Interest and a Protected Historical Heritage, renovated as a rural house. This is a constant reform and improvement project. Currently, the fortress preserves the appearance of the castle, the tribute tower, the courtyard of arms, and the religious center with a landscaped area, the small cemetery, and the Sant Bartomeu church, with a Romanesque style. 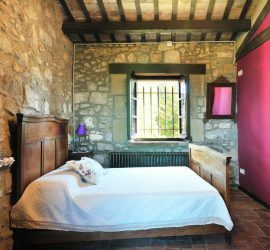 The Castle is fully renovated for the comfort required by rural tourism facilities, with a capacity up to 16 people, while retaining the main and most recent segmentations of the last use of the castle: Rectory and schools of the municipality. The old Tribute tower, is distributed from a distributor hall with an old well, which gives way to the whole of this differentiated apartment, with 5 bedrooms (4 with double bed, 1 with two individual beds), 3 full bathrooms, 2 living rooms and a kitchen equipped with a terrace with wonderful views of the immensity of nature. 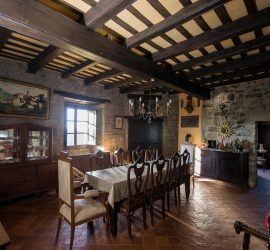 The old schools are divided into two distinct areas, one with 3 bedrooms (1 with a double bed, 2 with two single beds) and a bathroom, and the other with a living room with a fireplace and with fully equipped kitchen.